Thai Colours .....Many people are curious about the wearing of certain colours in Thailand. Sometimes photographs coming from Thailand will show a mass of people wearing yellow, sometimes a riot of pink and sometimes a sky blue. It's as though the people all belonged to the same workplace and wore a uniform. Often the photographs will show Thais dressed in a sea of one colour, lining the streets to pay homage to King Bhumibol, Queen Sirikit, or the now deceased but still revered King Chulalongkorn. Sometimes they will wear the "royal" colours to make a point at a political demonstration. Wearing a particular colour does mean something in Thailand. It is based on ancient beliefs and strict Buddhists will wear a certain colour each day – even if the colour is not obvious. More recently however, the coloured tee-shirts have been worn to display loyalty to the monarchy at a time when the political situation was in danger of disintegrating into chaos. 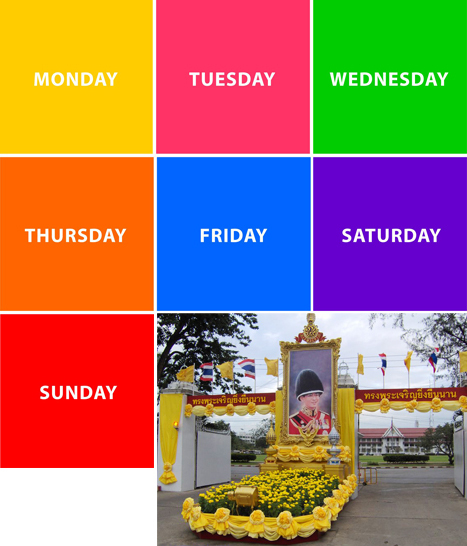 There is one colour for each day of the week and although conforming to this dress code is not essential, many Thais like to adhere to the system and will consider it when dressing. Sometimes it may be just to make sure they don’t wear the wrong colour on that day. Each day’s name relates to the planets in ancient Indian astrology. 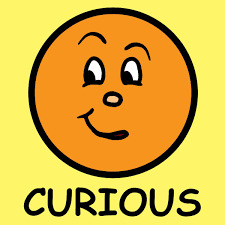 On the King’s birthday, December 5th, most people will try and wear yellow during the day and of course, they will have the yellow flag flying wherever they can. Ditto for Queen Sirikit’s birthday on August 12th, when blue takes precedence. Pink became popular when the king left hospital last year after his illness, looking frail in a bright pink blazer. Within hours, pink shirts were on sale across the country and were being worn in their thousands to show solidarity and to help the king's recovery. Wearing pink, the Thais said, would bring the king good fortune and good health. The draping of coloured ribbons and lengths of gauzy fabrics around sacred trees, on special "lucky" sites, on the prows of boats, on spirit houses, chedis and anything else which may influence the gods, is another aspect of this adherence to the special colours. Usually, a garland of yellow, pink, blue and green will suffice, as these are the most important colours, and the ones that connect both the royal family and the gods of the planets. A tourist who wears yellow on a Monday, especially if it is a tee-shirt with the King's Crest on the pocket, will be sure to gain admiring glances from the Thais. Thai Buddha for each day which one is you? Farang ... What does it really mean? Friend or Foe?